White blood cells, or leukocytes, are the immune system’s warriors. So when an infection or disease attacks the body, the system typically responds by sending more white blood cells into the fray. This means that checking the number of these cells is a relatively easy way to detect and monitor such conditions. Currently, most white blood cell counts are performed with large-scale equipment in central clinical laboratories. If a physician collects blood samples from a patient in the office—usually requiring a full vial of blood for each test—it can take days to get the results. But now engineers at the California Institute of Technology (Caltech), working with a collaborator from the Jerusalem-based company LeukoDx, have developed a portable device to count white blood cells that needs less than a pinprick’s worth of blood and takes just minutes to run. Portable white blood cell counters could improve outpatient monitoring of patients with chronic conditions such as leukemia or other cancers. The counters could be used in combination with telemedicine to bring medical care to remote areas. The devices could even enable astronauts to evaluate their long-term exposure to radiation while they are still in space. The researchers describe the work in the April 7 issue of the journal Lab on a Chip. There are five subtypes of white blood cells, and each serves a different function, which means it’s useful to know the count for all of them. In general, lymphocytes use antibodies to attack certain viruses and bacteria; neutrophils are especially good at combating bacteria; eosinophils target parasites and certain infections; monocytes respond to inflammation and replenish white blood cells within bodily tissue; and basophils, the rarest of the subtypes, attack certain parasites. The prototype device is able to count all five subtypes of white blood cells within a sample. It provides an accurate differential of the four major subtypes—lymphocytes, monocytes, eosinophils, and neutrophils. In addition, it could be used to flag an abnormally high level of the fifth subtype, basophils, which are normally too rare (representing less than one percent of all white blood cells) for accurate detection in clinical tests. The entire new system fits in a small suitcase (12″ x 9″ x 5″) and could easily be made into a handheld device, the engineers say. 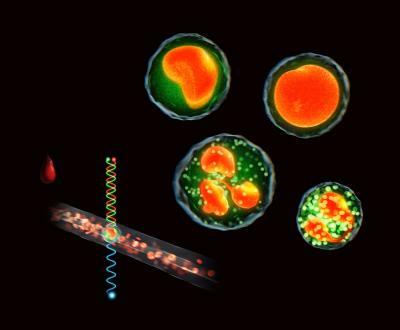 A major development reported in the new paper is the creation of a detection assay that uses three dyes to stain white blood cells so that they emit light, or fluoresce, brightly in response to laser light. Blood samples are treated with this dye assay before measurement in the new device. The first dye binds strongly to the DNA found in the nucleus of white blood cells, making it simple to distinguish between white blood cells and the red blood cells that surround and outnumber them. The other two dyes help differentiate between the subtypes. The heart of the new device is a 50-micrometer-long transparent channel made out of a silicone material with a cross section of only 32 micrometers by 28 micrometers—small enough to ensure that only one white blood cell at a time can flow through the detection region. The stained blood sample flows through this microfluidic channel to the detection region, where it is illuminated with a laser, causing it to fluoresce. The resulting emission of the sample is then split by a mirror into two beams, representing the green and red fluorescence. Thanks to the dye assay, the white blood cell subtypes emit characteristic amounts of red and green light. Therefore, by determining the intensity of the emissions for each detected cell, the device can generate highly accurate differential white blood cell counts.